My usual Easter baking is extremely traditional, and generally involves a couple of Cadbury Mini Eggs presented in simple 'nests' made from chocolate covered cornflakes. But this year I thought I'd have a go at something different, and so I tried some Mini Egg cookies. I know that it's not actually Easter for ages yet, but it's good to have a practice in advance. Also I've managed to resist Mini Eggs in the supermarket since just after Christmas, so I've done pretty well to get this far! I used a very simple cookie recipe which requires few ingredients and was found originally on the Living it Little blog, sadly no longer available. It works very well when any type of confectionery is added - I've also used Smarties, Maltesers, Minstrels and chopped up chocolate. 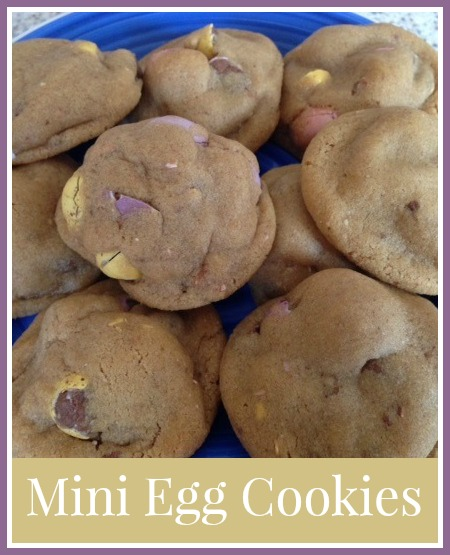 The Mini Eggs do make the cookies rather bulky, and so perhaps cookie style cakes would be a better description, but they are still delicious! Cream together the sugar and the butter, then add the flour and syrup and mix to a dough before adding the Mini Eggs. I make my dough in an electric mixer, and I found that the mixer bashed the Mini Eggs about a bit which worked well in the cookies. Otherwise you could leave them whole, which will increase the depth of the cookie, or perhaps break them up a bit using a rolling pin before putting them in. Roll the dough into small balls slightly larger than a walnut, flatten very slightly, and place on a greased baking tray. Bake in the oven for about 7 minutes at 180C. The most important thing to remember with these cookies is that you need to remove them from the oven as soon as they start to brown on top, even though they will still be rather soft and spherical in shape. Leave them on the baking tray to cool and they will flatten out. I find that this recipe makes about 15 good sized cookies, although natural wastage does usually occur during the shaping of the cookies, especially if there are small children about. Next I'm thinking about attempting a Cadbury's Creme Egg batch of cookies. I wonder if they'd work, or whether they'd turn out too sticky?